Thousands of union and non-union workers and their allies shut down the streets around the posh Palmer House Hilton here yesterday, protesting the right-wing American Legislative Exchange Council (ALEC) meeting at the hotel. 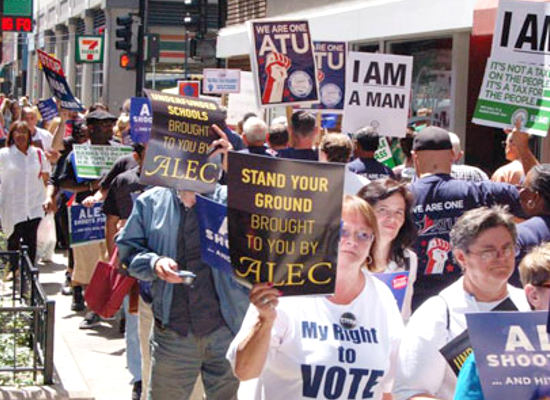 The demonstrators, organized by the 500,000-member Chicago Federation of Labor (CFL) and a host of community allies, say ALEC is hurting just about everyone in America who is not part of the top one percent. Outside the hotel, on Monroe Street, the Musicians Union Band played “When the Saints Go Marchin’ In” as wave after wave of members from every union in Chicagoland filled the sidewalk and the street. Elevated Chicago Transit Authority trains passing along the Wabash Ave. blew their horns in support as hundreds who couldn’t fit on Monroe Street spilled out to the adjoining street under the train trestle. The crowds roared every time they heard the train operators blow the horns. “This is a beautiful gathering not just of union workers and non-union workers but of all our allies as well—a true coalition,” declared Bob Reiter, secretary-treasurer of the CFL, in his speech to the cheering crowds. “Save the workers, save the teachers, save the students, save the youngsters, save the carpenters, save the janitors and the machinists—save all your people,” the Rev. Jesse Jackson Sr. implored from the podium. The crowd shouted approval after each group he mentioned. Among the demonstrators against ALEC was Melissa Rakestraw, a letter carrier from Schaumburg, IL.